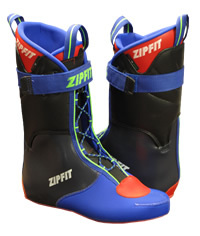 Sven Coomer’s Zip Fit custom inner boots are used by some of the world’s top skiers, including World Cup athletes and pros who are on the hill over 100 days a year. No matter what shell you use, Zip Fits increase comfort, warmth and performance, for any level skier. The inner boot pictured is the Gara. Only at top boot specialty shops.